In the heart of Africa, a unique lake attracts the attention of scientists since the beginning of the 20th century. At the foot of the Virunga volcano chain, Lake Kivu harbors a vast amount of dissolved carbon dioxide and methane, making this lake the most dangerous lake on Earth. But the lake furnishes also many goods and services for surrounding populations and may soon become the most important energy supplier in the area. At the beginning of gas exploitation, the time has come for gathering the large amount of scientific information acquired during past and present research on Lake Kivu. The eleven chapters cover many aspects of the physics, geochemistry and biology of the lake, with a particular focus on the unique physical and geochemical features of the water column and on the ecological functioning of the surface waters. The impacts of the introduced fish species and the potential impacts of methane exploitation are also summarized. This multi-disciplinary book may also be used as an introduction to the limnology and biogeochemistry of large tropical lakes, as it covers various aspects of the physics, geochemistry, biology and ecology of the African Great Rift lakes. Illustrations note XII, 192 p.
In the heart of Africa, a unique lake has attracted the attention of scientists since the beginning of the 20th century. At the foot of the Virunga volcano chain, Lake Kivu harbors a vast amount of dissolved carbon dioxide and methane, making it the most dangerous lake on Earth. But the lake also furnishes many goods and services for surrounding populations and may soon become the most important energy supplier in the area. At the beginning of gas exploitation, the time has come to gather the wealth of scientific information acquired during past and present research on Lake Kivu. The eleven chapters cover many aspects of the physics, geochemistry and biology of the lake, with a particular focus on the unique physical and geochemical features of the water column and on the ecological functioning of the surface waters. The impacts of the introduced fish species and the potential impacts of methane exploitation are also summarized. 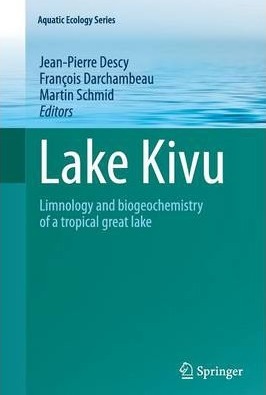 This multi-disciplinary book may also be used as an introduction to the limnology and biogeochemistry of large tropical lakes, as it covers various aspects of the physics, geochemistry, biology and ecology of the African Great Rift lakes. 1. Lake Kivu : Past and present.- 2 Stratification, mixing and transport processes in Lake Kivu.- 3. Nutrient cycling in Lake Kivu.- 4. Variability of carbon dioxide and methane in the epilimnion of Lake Kivu.- 5. Phytoplankton of Lake Kivu.- 6. Microbial ecology of Lake Kivu.- 7. Zooplankton of Lake Kivu.- 8. Fishes in Lake Kivu: diversity and fisheries.- 9. Paleolimnology of Lake Kivu: past climate and recent environmental changes.- 10 Methane formation and future extraction in Lake Kivu.